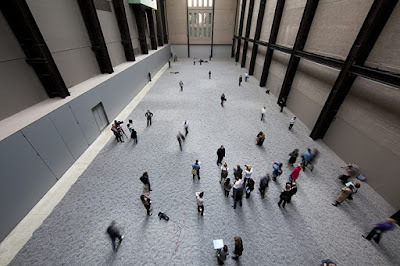 The latest Turbine Hall Commision has been unveiled at the Tate Modern, created by Chinese Artist Ai Weiwei. 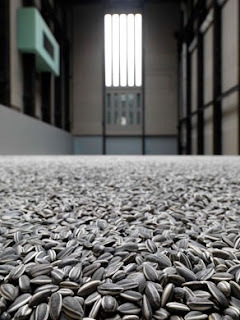 The Turbine Hall has been filled with 100 million sunflower seeds, each hand-made from porcelain and hand painted by specialists in the city of Jingdezhen. 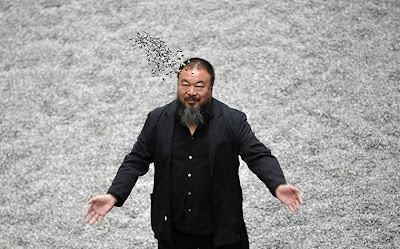 Apart from just being a fun exhibition where people can interact with the somewhat fluid aspect of the seeds and the constantly changing installation, perhaps stealing a few as well, Ai Weiwei aims to explore the "Made in China" phenomenon with this non-industrially created installation. Each seed is unique and the material being a prime export from China draws more emphasis on his point. I'm looking to visit the gallery at some point in the next few weeks. For gallery information, click here. UPDATE: The Turbine is closed indefinitely. 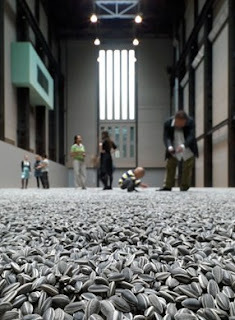 The seeds can be viewed from the ground floor, the first floor and the window on the upper floor, but cannot be accessed due to "harmful fumes" created when treading on the porcelain. This is seriously lame and ruins the whole point of the exhibition. Seriously, just give us masks which would further enhance the experience and meaning of this work opposed to being "safe" and closing it off to NO-ONE's enjoyment. It's on display until May 2011 so hopefully it will not be so restricted in the near future. I went to see this exhibition a week or so ago with a friend, you can walk right up to the edge of it, but not on it any more... what a shame. 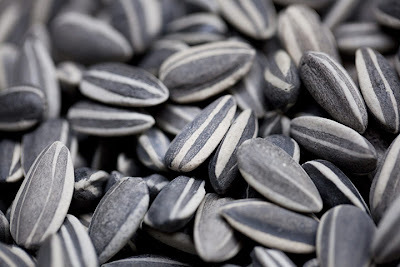 Apparently there are 100 million seeds there - than than the number of people in Britain (bout 65 million I think?) . Crazy. And even if there were less, to make it actually 65 million, I'd be just one little seed, how insignificant it seems. oh well.